Place the butternut squash in a tray and sprinkle over the mixed spice. Add 25g butter, salt and pepper, then cover with tin foil and cook in an oven at 140 degrees for 1 hour. In a hot pan sear the seasoned venison until brown on all sides (at The Hoste we serve our venison rare, so if you prefer it cooked more please do so at this point). Allow to rest, then cook the savoy cabbage in a pan with the rest of the butter over a medium heat. Taste and season. Take the squash out of the oven, place in a food processor and blend to a puree. Bring the red wine sauce to a simmer, adding the blackcurrants and thyme. Place some of the puree in the middle of each plate, then add the savoy cabbage. Slice the venison steaks and place on top of the savoy cabbage, then pour over the sauce. At The Hoste we add butternut squash moons to the dish, which have been slowly cooked in butter. 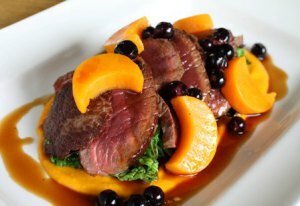 You can also use venison from the haunch instead of the loin.